Department. 268 vacancies available in Nagpur forest department and 92 vacancies available in Gadchiroli Forest Department. Eligible criteria having interested candidates can apply online @mahapariksha.gov.in on or before 02-02-2019. Selection for these vacancies will held through Physical Efficiency, Standard Test, certificates verification followed by medical tests. 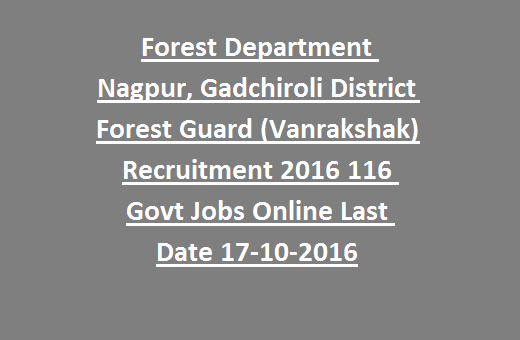 For more information regarding this Nagpur, Gadchiroli Forest Guard Recruitment 2019 complete details see the below information. 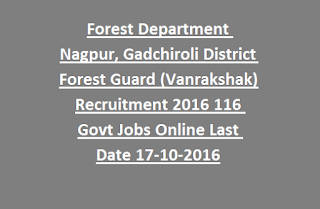 116 Forest Guard vacancies available in this Nagpur and Gadchiroli Forest Departments recruitment. Upper age limit is 25 years and lower age limit is 18 years. For reservation having candidates age limits are extendable up to 5 years. HSC or 12th pass in Maths or Commerce or Science or Geography or its equivalent qualification from a recognized board by Maharashtra State. Rs.300 for General candidates and Rs.150/- for reserved candidates. Pay amount through SBI chalan. Chalan to be generated at the time of online application. Selection for these Nagpur, Gadchiroli, Districts Forest Guard recruitment will be held through Physical Efficiency Test and Physical standards test. Weight is calculated based on candidates height. For Male Candidates 5 Km running to be completed in 30 Minutes or less time. For Female candidates 3 Km running to be completed in 30 Minutes or less time. Those who qualified the physical tests, preliminary running test and certificates verification, based on merit in Running and educational qualifications 1:3 members only called for the 25 kms distance running test. Sufficient qualifications and physically fit candidates can apply online for this forest guard jobs through the Maharashtra recruitment website @mahapariksha.gov.in. Complete all the necessary information and submit the application form online on or before 17-October-2016.